Cala d’Or is consisting of five small beaches. The largest beach is Cala Gran that is only 40 metres wide and 100 metres deep; the remaining four beaches are also almost the same and are located within sheltered coves. This is made due to the peak season during summer month; with those five separated beaches the tourists will be able to not just stick in one place, thus making more rooms for others to enjoy the clear waters of the beach. If you also want to see other magnificent nature scenery, you may as well visit Mondrago Natural Park, which is a little further from the resort. You can reach the park by means of a car or a boat. The travel may sound a bit of a hassle, but you can never miss the feeling of freshness and cleanliness that this park can give you, for the area has been protected from the development. Plus, the two beaches that are present here namely, S’Aramador and Mondrago, can also offer you soft white sand and splendid blue sea. The park also has beach bars and several trails that you can walk around while sightseeing. But if you are in for something that is really wild, Cala Verques is always open for you. This place has no car parks and facilities, but it can assure you of the best and amazing scenery that has big waves that are suitable for those surfers and other beach goers who loves thrilling waves. When it comes to hotel accommodation and facilities, Cala d’Or can give you quality service that you want. This resort is filled with different hotels and apartments especially big Spanish Hotels that offer great convenience particularly to those vacationists. Swimming pool and evening entertainment are just some of the features that you will experience once you check in. These hotels are also bookable through a travel-agent so won’t have to worry if you come during peak seasons. The following are some of the places that can be suitable for what you prefer in a hotel: Sa Galesa is a finca which is little more remarkable place that you can stay in that is located near the hills on the west of Cala d’Or and is still not far away from the coast. While Santanyi also has a lot of lovely boutique hotels. Or you can try the romantic rural retreat in Es Turo. For those who want to try a divine boutique experience go to S’Hotelet de Santanyi. Finca Can’n Bota and Finca Son Roig are charming hotels that lie in Felanitx. Finally, for those who want to try a finca-hotel that has the pleasant contemporary touches of the beautiful surroundings go a bit further to the north towards Manacor wherein Sa Franquesa Nova beautifully lies. Aside from accommodating hotels, Cala d’Or also has different bars and cafes that you can easily find on the street side towards the British market. But if you want something really special you can try heading towards the marina/harbour wherein you can find many high-class restaurants, such as Yacht Club, which is known for its great views of the marina. Port Peit and Gadus are also some of the best restaurants located there. If you think that the above-mentioned are not enough, there are more features that this beach resort can offer you. Some companies in Cala d’Or that has boat trips either whole day or half day, but if you think that it may cost you a lot, then you can use your own boat to explore the beach properly. Also, snorkeling and diving are some of the most popular activities that are offered in the east coast. Other activities also includes tennis, golf (in Vall d’Or), cycling (on Mallorca) and hiking in the hills behind the east coast such as in Llevant ‘mountain’ and Mondrago Natural Park. For those fashion enthusiasts, there are plenty of boutiques and souvenir shops that can be found in the resort. However, there are no markets in the resort, but the closest one is at Santanyi, which is open during Wednesday and Saturday or Felantix during Sundays. 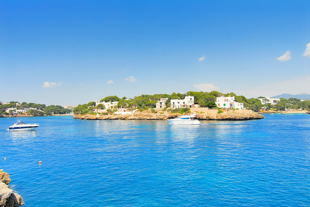 Plan for your trip in Cala d’Or and experience the relaxation and fun you ever want to have for you and your family! Or you like to buy a nice property for you or your family please visit our great selection now.